If you follow me on Facebook you’ve probably already heard this story, but it bears repeating. On the first day of the intense fires in Santa Rosa, CA (I live 10 miles from there), I was watering my garden in the smoky air, and I noticed something unusual in one of the flower pots. 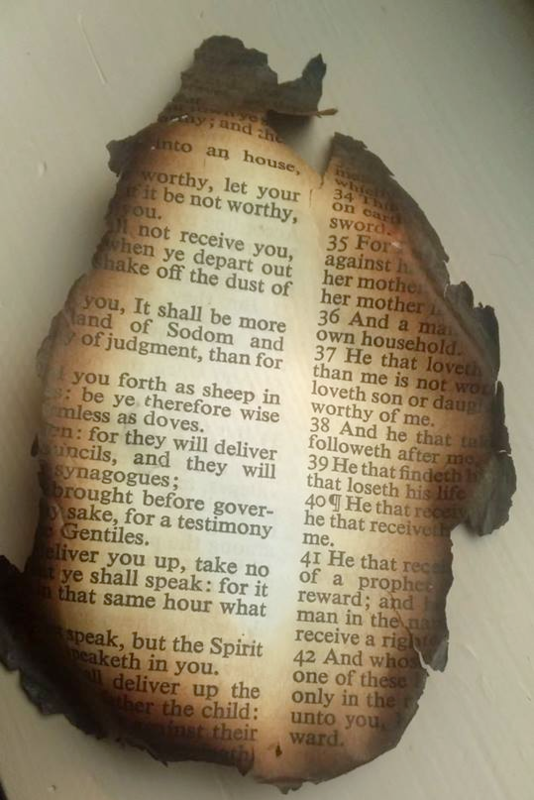 It was a burnt page from The Bible that had been carried on the wind from somebody’s burning house… ten miles away. Naturally this intrigued me. The debris that blew into my yard from the fire could have contained anything — a page from People magazine or a comic book — but instead, it was this page, and the passage was extremely relevant. It was Matthew 10:16-20, where Jesus tells his disciples to go out into the world to teach and heal, but warns them that their work may anger people because it will challenge belief systems and social structures. Considering the work I do (and the work many of you do as well), this is a powerful message for all of us. The cosmic communique that landed in my garden reminds us that guidance from Spirit is always raining down upon us; we simply have to know how to listen and interpret. It also clarifies that teaching about consciousness and life beyond the body is a sacred calling, and when we feel that the divine is speaking through us with messages of love and awakening, we should trust that feeling.